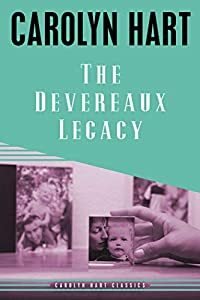 The Devereaux Legacy by Carolyn Hart: Synopsis and Online Purchase Options. Synopsis (from the publisher): Leah Devereaux is a dead woman. At least, that's what the folks now running the Devereaux plantation tell her: Leah has been presumed dead for nineteen years — since the day that both her parents died. Leah, very much alive, has returned to South Carolina to uncover the untold story of her parents' deaths. While some, like her adopted cousin Merrick, welcome her, Cissy and John Edward tell her to stay away, tell her to stop meddling in secrets long kept. Clicking on the above button(s) will open a new window or tab on the respective vendor's website with more information about purchasing this book. (Links to Abe Books, Alibris, Biblio.com, and Books-a-Million are to the home page only.) Availability of books from listed vendors is subject to change without notice. Mysterious Reviews is a participant in several affiliate programs that may provide a commission or advertising fee as the result of a product sale; see our full disclosure on the About page.